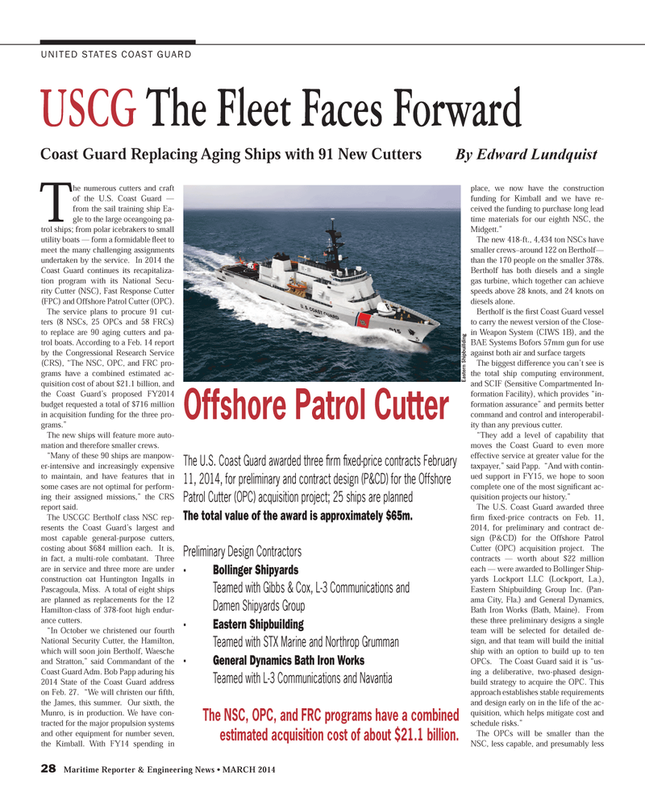 Coast Guard continues its recapitaliza- tion program with its National Secu- rity Cutter (NSC), Fast Response Cutter (FPC) and Offshore Patrol Cutter (OPC). The new ships will feature more auto- mation and therefore smaller crews. “Many of these 90 ships are manpow- er-intensive and increasingly expensive to maintain, and have features that in some cases are not optimal for perform- ing their assigned missions,” the CRS report said. The new 418-ft., 4,434 ton NSCs have smaller crews–around 122 on Bertholf— than the 170 people on the smaller 378s. Bertholf has both diesels and a single gas turbine, which together can achieve speeds above 28 knots, and 24 knots on diesels alone. The total value of the award is approximately $65m. The NSC, OPC, and FRC programs have a combined estimated acquisition cost of about $21.1 billion.